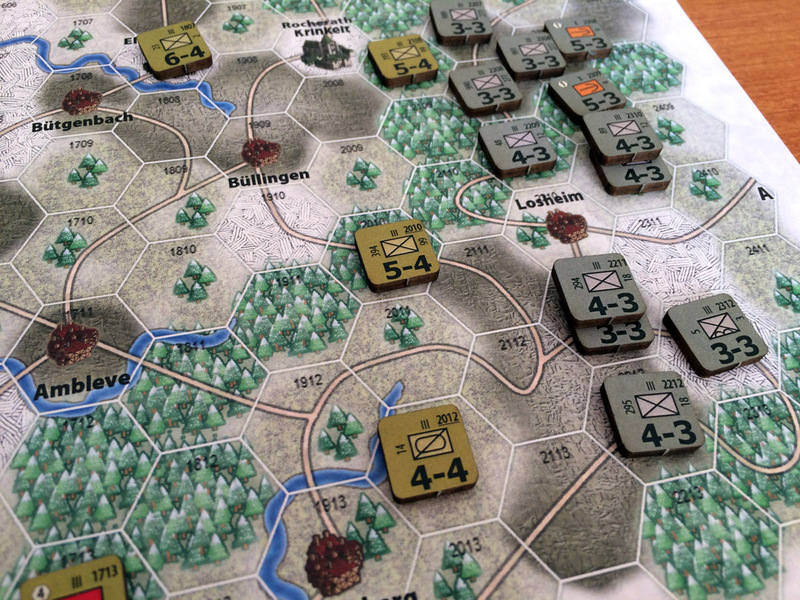 ‘Paul Koenig’s The Bulge: 6th Panzer Army’ (to use its full name) is a tactical, 2-player, World War II game with a hex map and counters. However, it packs a massive amount of decision-making into such a small area, and with relatively simple rules. One player plays the German army trying to break through the Allied lines by a surprise advance through the Ardennes forest (an event of major importance during the war), and the other player plays the Allies. This means the two sides are quite different – the Germans have lots of units but also have a lot of work to do as they need to advance to capture cities and get across the map; whereas, the Allied player has few units and needs to use these to hold up and disrupt the German advance.